Will SwitchVPN turn you on – or off? There's the core of a good VPN here, but SwitchVPN’s many issues make it difficult to recommend. SwitchVPN is a small US-based VPN provider which makes some very eye-catching claims about its service. Currently the website headline is "a simple and powerful app to keep the internet free", for instance, claiming later that "SwitchVPN keeps the internet free from anywhere in the world." Can it save you money? No: read a little more and you'll discover this means "free from monitoring". That's also an appealing claim, but equally untrue, as no VPN can block all the ways in which you might be monitored online. There are other dubious claims on the site. 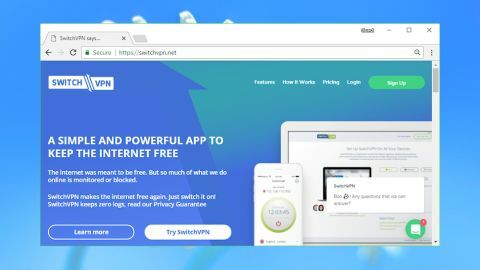 Will SwitchVPN really "boost your internet speed"? We doubt it. Can it prevent 'any' spying on how you use the internet? No. Does a claim to "stream television and films from anywhere at fast speeds" guarantee that you'll unblock Netflix and every other service, and that you'll get quality HD viewing? We'll bet it doesn't. It's a pity SwitchVPN has taken this approach, because the company does have worthwhile features to boast about. 145 servers spread over 35 locations, for instance. P2P support everywhere. Up to five devices can connect at the same time, and the service has clients for Windows, Mac, iOS and Android. SwitchVPN is priced at $9.95 (£8) for a one-off month, or $6.66 (£5.30) if you pay for a year upfront. That's relatively expensive – even a quality provider like NordVPN charges only $5.75 (£4.60) for its one-year plan – but could be worth paying, if the service is good. There's no free product or trial to sample the service, unfortunately, but SwitchVPN does give you a no-strings unconditional 30-day guarantee. If you're unhappy, they say, send an email and you'll get your money back. The SwitchVPN website makes familiar promises about keeping "zero logs" and that "we do not log any activity or data of our users", but we've learned that these claims don't always mean very much. SwitchVPN didn't improve our confidence by telling us we could find out more in a "privacy guarantee" which doesn't seem to exist. The policy did tell us that "SwitchVPN does not collect or log any traffic or use of its Virtual Private Network service", which seems to at least rule out any logging of your activities. "Company may collect potentially personally-identifying information, such as Internet Protocol addresses, media access control addresses, network routes, technical data, usage statistics, traffic patterns and social sharing patterns to better understand how the Service is being used." We don't know which of these might be recorded, if any, but it seems this might at least allow some detailed logging of VPN session data. This won't cover exactly what you did or where you went online, but could provide a lot of detail on a single session: the date and time of the connection, a device-specific MAC address, the incoming and perhaps outgoing IP address, the bandwidth used and so on. This won't reveal much about your activities, and SwitchVPN says it won't share personally-identifying information, so any logging may not have much practical impact. But this still allows for creating much more of an audit trail than you'll get with many other services, and the privacy-conscious might be tempted to look elsewhere. The SwitchVPN signup process uses a familiar wizard-type approach. Choose a plan, click Next; enter an email address and password, click Next; choose a payment method (card, PayPal, Bitcoin) and hand over your details. There were no surprises of any kind, and our subscription was active in less than a minute. The website took us to a page displaying basic account details. Some providers make it difficult to cancel accounts or change billing terms, but not SwitchVPN – the account page has clear buttons to disable auto-renewal or cancel your subscription. Unusually, SwitchVPN didn't send us a 'Welcome' email with account details or help links. That could be an immediate hassle if you close the browser window displaying your randomly allocated username and password, because they're not immediately available in your Inbox. Still, log in to the website and it's easy to find basic tutorials on installing the desktop and mobile clients, or manually setting up OpenVPN and individual devices. We pointed our browser at the Windows client page, and were a little concerned to see a download link of 'http://app.getupdate.online/updates/windows/installer_online.exe'. An HTTP link, rather than HTTPS, pointing to a domain that has no obvious connection to SwitchVPN? This seemed unprofessional, at best. We downloaded the file anyway, and noticed it was digitally signed by CS Systems, the company behind SwitchVPN. Reassured, we launched the installer, it set up the service without any hassles, and we were ready to explore. The SwitchVPN client started well, a stripped-back interface displaying our current IP, a checked option to 'automatically select server' and a single 'Connect' button. But then we tapped 'Connect', expecting to be hooked up with a nearby UK server, only to be given an IP in New York. A mistake? We tried again, and were given IPs in Spain, then Washington, then Dallas, then Luxembourg. This seems bizarre, and makes the 'automatically select' feature almost useless. We would expect to be allocated the nearest server to our physical location, not have one chosen apparently at random that could be thousands of miles away. Fortunately, automatic server selection can be turned off with a click, and manually choosing our locations worked much better. There's a simple list of locations, double-clicking anything connects to it immediately, and a basic favorites system keeps your commonly-used locations grouped together. Desktop notifications tell you when you connect and disconnect, and the client displays your current upload and download speeds in real-time. There are more settings than we expected, too. A Network Lock acts like a kill switch, blocking internet traffic if the connection fails. You're able to choose from several protocols, including OpenVPN via UDP or TCP, L2TP or PPTP. Low-level options let the user set the MTU size and define a proxy, and launch settings enable running the program when Windows starts, and optionally reconnecting to the last used location. Performance was consistently good in our tests*. Local UK connections managed download speeds of 30Mbps and higher, the closest European cities typically gave us 25-30Mbps, and the east side of the US averaged 25Mbps. Los Angeles was disappointing, and the best we could manage in Asia was around 8Mbps from Japan, but that's not unusual for very long-distance connections. We noticed one possible issue during testing. A couple of times we left our system connected, went away for 15 to 30 minutes, and found we'd lost internet connectivity when we got back. Windows thought we were online, SwitchVPN's console said we were connected, but our browsers and email client couldn't access anything. Tapping 'Disconnect' in SwitchVPN fixed the problem immediately. We can't say for sure what this means. It might be something specific to our system, a temporary network problem, or something else entirely. We're not going to count this as a major black mark against SwitchVPN, but keep it in mind if you sign up. See what happens when you stay connected for a long time, as well as running speed tests and any other checks you might wish to do. SwitchVPN began to impress us again at the end of the review, as we ran our privacy tests. The service allocated IP addresses in its promised locations and successfully blocked all DNS and WebRTC leaks, keeping our identity private at all times.